This may sound sappy, but the first publication I ever wrote for was my journal – a handmade newsletter with one subscriber: me. I published every day or so when life was particularly fascinating. Sometimes a month or a year (or three) would go by without a word from me to myself. I'm sure most of those pages belong in one of two files labeled "trite" and "huh?," but in spite of the lack of evidence, I knew I was a writer. Of course, no one else knew this, though some took my word for it. About 30 years ago, one person called my bluff. It was a continuing ed teacher in Atlanta, Georgia (where I lived at the time), named Jeannie Hallem. I guess I was actually calling my own bluff by taking her class titled "Breaking into Print." She not only taught the ropes of "real" writing for publication, she actually expected her students to write and submit stories. So I wrote some stories and even submitted one to Atlanta magazine. Editor Lee Walburn bought and published it to my extreme delight. And now, 30-something years after that, here I am composing this note for you. Guess I was right about being a writer back in my journal days, but Jeannie Hallem didn't care what I was. She cared about what I did. That made all the difference. Here in New Hampshire we've been blessed for 25 years to have an entire organization offering that same mixture of support and accountability to those who think they can write. The New Hampshire Writers' Project has offered great service since the beginning, but their real legacy is the connections they have made along the way, uniting writers of all abilities through networking, conferences – heck, just knowing one another's names. Nothing transforms wannabee "writers" into "people who actually write" like a little peer pressure. And "people who write," IMHO, are the transformative agents of civilization. The Writers' Project has also brought fresh awareness and well-deserved fame to a number of local authors who were better known nationally than here at home. Poets like Donald Hall and Maxine Kumin, writers like Ernie Hebert and Jodi Picoult, even that scholarly fellow who wrote "The Da Vinci Code" (Dan something, I think) have all been players with the Project. It was good word of mouth from Writers' Project members that helped get Paul Harding's book "Tinkers" before the Pulitzer Prize committee. It won. 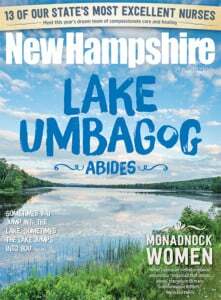 Among plans for 2013 are the creation of a New Hampshire Writers Hall of Fame and it's a safe assumption that Grace Metalious (featured in this issue) will be among those names being considered for inclusion. And if you want an example of what can happen when a writer expands her readership from one to many, you need look no further.